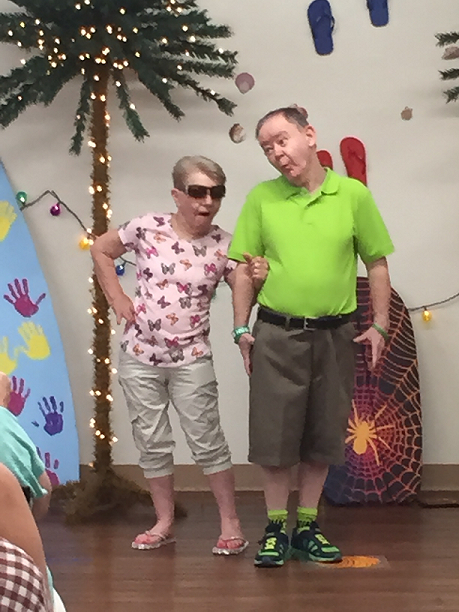 The Scheib IDD workshop 2015 fashion show was a huge success! This event was the first event in the newly remodeled David’s Activity Hall recreation room. 80 chairs were in the audience and so many people attended that the number of people standing was too many to determine. The audience consisted of family members of the special models in the show, Hill Country staff, Scheib Center Board members, and local supporters. As we all know, fashion sense is in the eyes of the beholder and everyone’s eyes gleamed with enjoyment as the show went on. Hill Country developmental disability director, Donna Brown, enthusiastically led her staff and clients for 3 months in preparation of this event. Their hard work was evident at every catwalk.Workshop trainers, JoNell Kor, Krystle Terrell, Kristin Miller and Supervisors Florence Spencer, Mary Guerrero worked alongside these fashionistas tirelessly helping them prepare.The Scheib board would like to acknowledge all of these women for their devotion and commitment to serving others.